Metal Sign Supplies In Bulk Cost Less! These Sign Supplies Support 30" Posters! 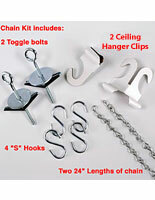 Sign Making Equipment Company Sells Wholesale Sign Supplies in Bulk or by the Piece! Snap-open rails give easy option for change-outs. Finished aluminum accents your marketplace. 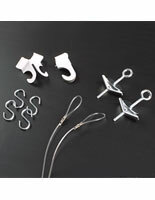 (2) provided adjustable eyelets make hanging from the ceiling easy. 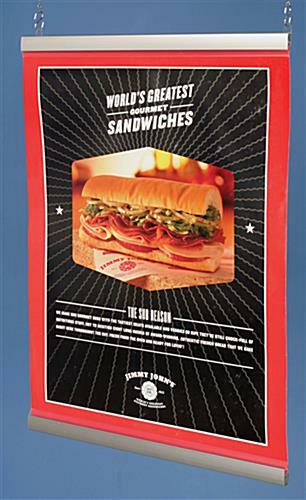 This sign supply, poster gripper is an excellent way to promote ongoing sales and events. The commercial sign supplies on sale at wholesale prices may be used individually or grouped to create an eye-catching display that everyone will notice. 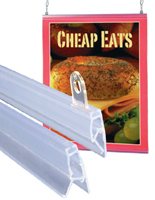 These rugged aluminum banner grippers are ideal sign supplies for long and heavy posters. 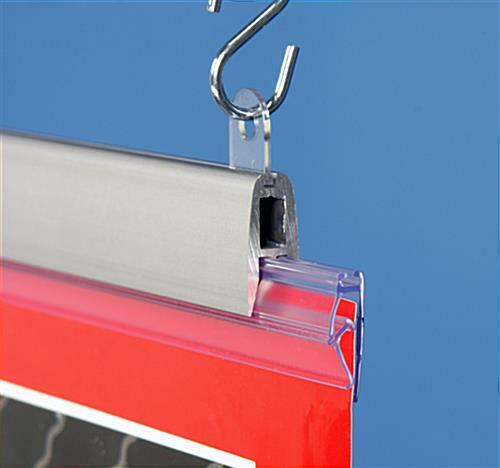 These discount sign supplies in bulk or by the set include adjustable eyelets on the top banner rail that makes it easy to find just the right spot to display your poster. 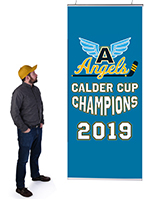 These banner displays, sign supplies are the stylish way to display business banners and posters. Suspended from the ceiling, commercial sign supplies allow retail establishments to attract customers to a specific area where promoted products are displayed and restaurants to promote daily or monthly specials. The adjustable eyelets increase the number of places your banner sign can be displayed. 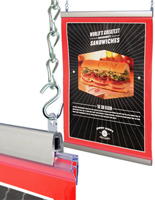 This poster gripper is designed to support a 30" graphic. The snap open top and bottom rails ensure fast, easy signage changes. The bottom rail keeps the graphic stretched out tight. Buy quality sign supplies in bulk to create an attractive ceiling display in your business! 30.0" x 1.8" x 0.5"